What McCain did was hard. What Murkowski and Collins did was much harder. In the early-morning hours after Senate Republicans’ last-ditch attempt to repeal Obamacare failed, a common narrative began to emerge: that while three “no” votes from Republicans killed the bill, only Sen. John McCain (R-AZ) saved the day. To be sure, McCain’s vote against the bill was dramatic and decisive. He flew back to Washington from Arizona less than two weeks after he was diagnosed with brain cancer, after having surgery to remove a blood clot from above his eye. He made a sweeping speechabout returning Senate procedure to a time of bipartisan, transparent cooperation. Then he proceeded to briefly horrify ACA proponents by voting yes on a motion to proceed vote, and yes again on the Republican Better Care Reconciliation Act. So when McCain cast a performative last-minute vote against “skinny repeal,” it immediately overshadowed the two women Republican senators who did far more to halt Republicans’ reckless efforts to repeal Obamacare. Sens. Lisa Murkowski (AK) and Susan Collins (ME) repeatedly stood their ground against the three health bills their colleagues tried to ram through the Senate. Murkowski and Collins were the only Republicans to vote against a motion to proceed with the health care bill debate. Both women cast votes against the Better Care Reconciliation Act, which could have led to 22 million more uninsured Americans. They both also voted against the Obamacare Reconciliation Act — repeal and delay — which could have led to 32 million more uninsured Americans. Both senators said they could not support bills that would leave millions of people without health insurance. They also opposed provisions to defund planned parenthood. When skinny repeal — seemingly the last shot for the GOP — came down, they stood their ground and voted no again. Through all of this, the backlash against these two women senators was severe. Two House Republicans threatened them with violence. 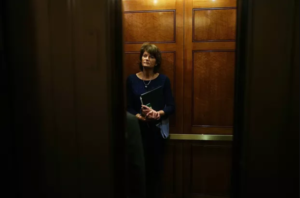 Murkowski then got a call from Interior Secretary Ryan Zinke, who reportedly threatened to punish Alaska’s economy based on her health care vote, according to the Alaska Dispatch News. McCain’s vote was crucial in ending the latest health care repeal effort — but no more so than the votes of Murkowski and Collins, which were consistently courageous in the face of threats and suggestions of retaliation.